First member of Tyneside 114 to dive this year was Gordon Lambert who managed to spend the first minutes of 2009 under the surface of Wastwater celebrating the New Year. 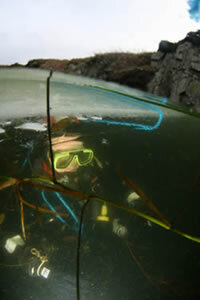 The Hunts also managed some New Year diving during a ‘dive’ break up at Oban. For the first ‘official’ club dive however, we chose to head for Cawfields Quarry just off the military road North of Haltwhistle. This dive however proved to be a real icebreaker. 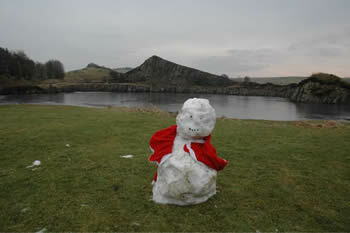 On arrival in the car park we were greeted by a cheerful snowman. Advancing down to the waters edge we were met by the spectre of a frozen ‘pond’ totally encased in a thick layer of ice! Fortunately, given the recent cold weather we had come prepared for just such a possibility. Ropes were unloaded and dry suits were donned. Nick Foster was the first to venture out across the ice. Fortunately the ice layer proved to be a couple of inches thick. However, Nick eventually located a weak spot and established a dive hole. 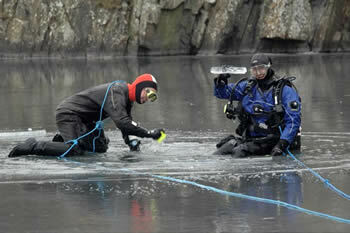 Andy Hunt then ventured out and acted as the lines ‘dive tender’ as Nick completed his dive under the ice. Underwater visibility proved to be quite reasonable with a few large perch still active on the bottom. 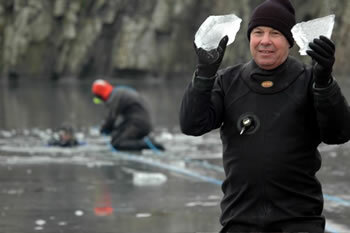 Once Nick was safely recovered it was time for Andy to venture under the ice. This he did with great enthusiasm although the combination of his twin set and the onset of a ‘warming’ Southerly breeze resulted in him falling through the ice as he made his way out towards the original ice hole. Not one to waste an opportunity Andy took advantage of the new ice hole to commence his ice dive with Nick taking on the tender role. It was an opportunity to practice rarely used signal communication skills via tugs on the rope. Dave Hyde meantime ventured out onto the ice to record Andy’s daring adventures and using his Sea and Sea housing to take some split level shots of Andy under the ice. After some experimentation a decent image was obtained seconds before the ice gave way and Dave found himself going for an unintended swim in the icy water. 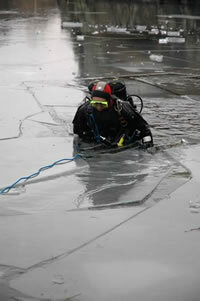 Fortunately, this scenario had been envisaged and Dave was well protected in his drysuit, gloves, hood and mask. He was also firmly attached to the land by a rope that was used to pull him back to shore, undignified yes, but effective in terms of ensuring a safe recovery. 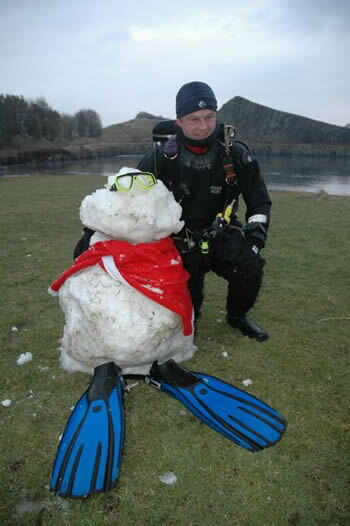 Richard Booth was on hand to record the ice dive saga, and not wanting to feel left out also took the opportunity to go for an ice snorkel and test out his new Xmas Fourth Element undersuit. It passed the warmth test, although seems a bit more buoyant than the weezle. More weight will be required for the next dive. With the light fast fading it was a quick change in the car park before the party headed back East for the liquid and culinary pleasures awaiting them in the bar of the Duke of Wellington in Riding Mill en-route home. The day’s events had highlighted the hazards of ice covered water, but also shown how sound training, preparation and the right equipment could result in a fun day out.